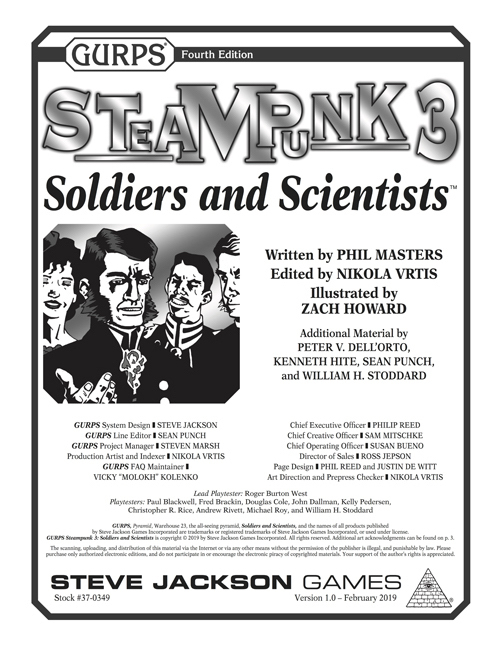 GURPS Steampunk 3: Soldiers and Scientists is a perfect companion to the award-winning GURPS Steampunk supplement for GURPS Third Edition. Discover the latest in steampunk's genres and themes with GURPS Steampunk 1: Settings and Style. 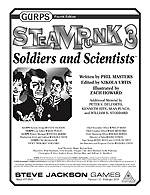 Augment your steampunk games with new insight into gear, weaponry, and outfits, courtesy of GURPS Steampunk 2: Steam and Shellfire! Transport your steampunk gear with panache, thanks to GURPS Vehicles: Steampunk Conveyances, an assortment of more than 30 different vehicles of varying realism. Bring your new steampunk expertise to GURPS Infinite Worlds: Britannica-6, an awe-inspiring 19th-century setting where Queen Victoria was never born! Arm your adventurers in style with GURPS High-Tech: Adventure Guns, a catalog of all types of Victorian firearms.